You've likely spent hundreds, if not thousands, on an amazing guitar setup and to chase that perfect tone. Don't cheap out on the switches. With Saturnworks, you don't have to. The Saturnworks loop pedal's versatility makes it a valuable addition to any guitarist's pedal board. The Saturnworks 5-loop bypass looper is individually hand crafted and bench tested in the USA. What makes the Saturnworks 5-looper design different from the rest?. The Saturnworks multi-loop pedal's versatility makes it a valuable addition to any guitarist's pedal board. Only WAV audio file can be uploaded to the looper from the computer. 1 Guitar Effect Pedal. Otherwise, the product may not work properly. Simple operation, one key to achieve almost all of functions. This is a pedal designed to be a footswtichable effects loop, NOT a audio looping pedal like the Ditto looper. The heart of the pedal, these switches are smoother and are rated for. Sure, you can save a couple of bucks spending your hard-earned cash on basic pedal with cheap components, but why sacrifice quality when it's your gear and your tone we're talking about?. 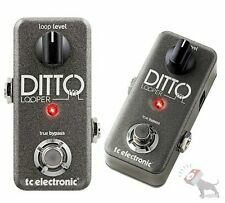 Ditto Looper makes looping as easy as 1-2-3. You press once to record, press once again to play the loop. You press and hold to Undo a layer and press and hold again to Redo. Press twice to stop, after which you can press and hold to clear the loop. 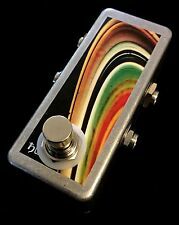 Hopper Pedals-TRUE BYPASS LOOPER PEDAL-Preserve Your Tone! !NEVER USED!! 1 Looper Pedal. Loop Length: 5 Minutes. Overdubs: Unlimited. Item Size: 9 4 3.5cm / 3.5 1.6 1.4in. 48K, 24bit lossless, uncompressed and professional tone quality. Item Weight: 216g / 7.6oz. You've likely spent hundreds, if not thousands, on an amazing guitar setup and to chase that perfect tone. Don't cheap out on the switches. With Saturnworks, you don't have to. What makes the Saturnworks 2-looper design different from the rest?. Handmade Looper-Guitar 3Loop Pedal switch Board-True Bypass Channel Selection! A must have for all musicians. Each loop can be engaged or disengaged independently allowing you to have any combination of effects pedals in your signal chain. Neutrik Jack Sockets for superior sound quality. Only WAV audio file can be uploaded to the looper from the computer. 1 Guitar Effect Pedal. Simple operation, one key to achieve almost all of functions. Output: 1/4″Monaural Jack (Impedance: 100K Ohms). You've likely spent hundreds, if not thousands, on an amazing guitar setup and to chase that perfect tone. Don't cheap out on the switches. With Saturnworks, you don't have to. The Saturnworks loop pedal's versatility makes it a valuable addition to any guitarist's board. Built with the toughest parts available. Loop Switchers have chosen the most practical and rugged enclosures to ensure each pedal can outlast any other on the market. No STRESS will ever be applied to the jacks and switches, because of the patented X & Y axis mounted components. 1 AB Looper Pedal Box For Your Effects Pedal (Without recording function ). Switch: turns the effect on/off. specifications Different regions . High quality electric guitar effects bypass switch (Without record function). The "In" and "Out" jacks are your guitar's signal. The switch turns the effect on or off and the LED indicates such. When they switch to dirty, they have to stomp the clean effects "off" and the dirty effects "on". That's a lot of fancy footwork that not necessary., enter the "Clean/Dirty Effects Switcher™. Clean/Dirty Effects Switcher™ (Vertical Layout). BRS - 3000T Light Gas Quenching Furnace Cooker Outdoor Survival Kit with a Pouch. Very appreciated for your support. The item in the actual use of the process of quality problems. May you like. Coins & Paper Money. Only WAV audio file can be uploaded to the looper from the computer. 1 Guitar Effect Pedal. Otherwise, the product may not work properly. 1 USB Cable. Simple operation, one key to achieve almost all of functions. How about create insane sounds such as a UFO landing, crickets chirping, or sirens?. The heart of the pedal, these switches are smoother and are rated for. Sure, you can save a couple of bucks spending your hard-earned cash on basic pedal with cheap components, but why sacrifice quality when it's your gear and your tone we're talking about?. What makes the Saturnworks blender looper design different from the rest?. 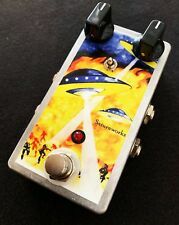 Saturnworks blender loopers use 'pro' grade footswitches. The heart of the pedal, these switches are smoother and are rated for. Simply connect the Looper into your effects chain. Then connect your chosen effects to the looped in and out connections on the Looper pedal. The Nose Skinny Looper weighs only about sixteen ounces and is a passive pedal (no power required). Plug your chosen effect pedals into the SEND and RECEIVE sockets, then engage or disengage them using the foot-switches. Engage or disengage 3 effects pedal individually. Each loop is independent so you can have any combination active at once.